Founded in 1982, the SNOPB tested and certified pilot-scale and large-scale methods of producing biological weapon (BW) agents developed in the laboratories of Biopreparat and the MOD, and issued technical documentation and recommendations. Although formerly under the control of the civilian Main Administration of Microbiological Industry (Glavmikrobioprom), the SNOPB was a military-run BW organization reporting to the Biopreparat authorities. Western and Russian experts have referred to the SNOPB as the Soviet Union's main facility for the manufacture of biological weapons and one of the largest installations ever created for this purpose. According to estimates by Western experts, the SNOPB facility had the capability to produce 300 metric tons of weapons-grade anthrax over a ten-month period. However, full production never took place. After its establishment, the SNOPB continued research and development work on anthrax that previously had been conducted at the MOD institute in Sverdlovsk, Russia but was curtailed after the 1979 accidental deadly release of anthrax spores from the facility. From 1984 to 1987, core specialists and equipment from Sverdlovsk were transferred to the SNOPB. By 1988, the SNOPB developed the Soviet Union's most deadly weapons-grade anthrax agent. The other activities of Stepnogorsk facility included production of staphylococcus toxin and also the development and experimental production of several civilian products such as vaccines, diagnostic tools, herbicides, and medicines. In addition to staff from Sverdlovsk, specialists from the MOD research center in Kirov, Russia, also worked at the SNOPB. After the collapse of the Soviet Union, Moscow stopped providing financial support for the SNOPB, resulting in a large exodus of biotechnology specialists. After work had ceased at the SNOPB, special decontamination measures were undertaken, and some military-related equipment was dismantled and destroyed. In 1993, a Presidential Edict founded the National Center for Biotechnology (NCB), which brought together most of the former Soviet military and civilian biotechnology facilities in Kazakhstan, including the SNOPB. At the same time, the SNOPB was reorganized into a joint stock company called AO Biomedpreparat for which initial funding was provided by the Kazakhstani State Program on Conversion. The facility started the production of various civilian products. However, Biomedpreparat encountered difficulties associated with the high cost of maintaining and amortizing the buildings, high energy consumption, large workforce, and management and transportation costs. As a result, the company's products were overpriced and noncompetitive. The financial support by the Kazakhstani government in 1993-1994, totaling $1 million, was not sufficient to fully reconstruct the facility for civilian needs or to provide all the former BW specialists with civilian jobs. In 1994, US-Kazakhstani cooperation began under the US Department of Defense's Cooperative Threat Reduction (CTR) program. Under this program, the US government and US partner firms provided investments to Biomedpreparat, totaling $5.8 million, for joint US-Kazakhstani production of civilian products. However, the deal failed because of mismanagement and lack of infrastructure at the facility. In March 1996, US-Kazakhstani intergovernmental negotiations continued, but this time focusing on dismantlement and destruction of remaining military equipment and systems at the Stepnogorsk facility, which still could pose a proliferation risk. The two sides also discussed a possibility of converting the remaining infrastructure and scientific expertise to civilian research and production. On the basis of these negotiations, on 5 December 1996, Kazakhstan and the United States signed a contract that provided funds for dismantling the main and auxiliary equipment at Biomedpreparat designed for military microbiological production. The CTR program was implemented in four phases. Phase one (completed in May 1998) included the elaboration of management plan, initial sampling and analysis, inventory of equipment and facilities, setting up of a safety monitoring laboratory, and creation of a dismantlement plan. The second phase (completed in September 2000) resulted in the dismantlement of three buildings at the facility. The third phase (completed in December 2000) was designed to prepare documentation for the fourth, and the final phase included the removal of ancillary equipment from the buildings of the facility. In 2006, as part of the Biological Weapons Infrastructure Elimination and Biosecurity and Biosafety (BS&S)/Threat Agent Detection and Response (TADR) project, the U.S. Department of Defense (DoD) dismantled two former production buildings 221 and 600 at the anthrax production plant at Stepnogorsk and constructed an epidemiological monitoring station at the National Veterinary Center in Astana. DoD also provided training in epidemiology and diagnostics, biosafety and bioethics, as well as vehicles and computer technology for approximately 450 personnel. 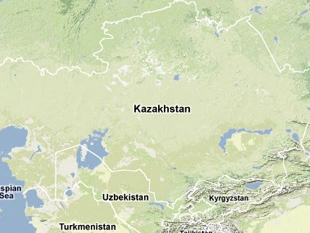 In addition, the third Cooperative Biological Research (CBR) project of the CTR Biological Threat Reduction Program mapped the occurrence of anthrax throughout Kazakhstan. At present, Biomedpreparat produces ferment preparations and disposable syringes. On 3 May 2006, the Kazakh government approved Conception of the Republic of Kazakhstan National Center for Biotechnology Development in 2006-2008. According to this conception Biomedpreparat facilities might be used for producing of 50 types of items (antibiotics, ferment preparations, proteins and vitamins) and it is planning to put into operation second production line for disposable, sterile syringes. Gennadiy Lepeshkin, "Byvshiye obyekty po razrabotke BO v Tsentralnoy Azii," Problemy Nerasprastraneniya, Special Edition, April 2001. Yevgeniy Troitskiy, "Fizicheskaya zashita, uchet i kontrol biomaterialov v NISKhI MON RK," Problemy Nerasprastraneniya, Special Edition, April 2001; "Cooperative Threat Reduction Annual Report to Congress Fiscal Year 2008," 31 December 2006, Defense Threat Reduction Agency, www.dtra.mil. "Conception of the Republic of Kazakhstan National Center for Biotechnology Development in 2006-2008," Government Decree No.363, 3 May 2006, Kazakhstan government official website, http://ru.government.kz.